May 2008 Last Sunday, 4th May, I had intended to move the beast to Bankstown airport but instead decided to stay on an extra week to fly more demanding aerobatics. If any mechanical bugs surfaced, the local maintenance outfit happened to be available to respond immediately. As it turned out, the bird ran smoothly without any problems. 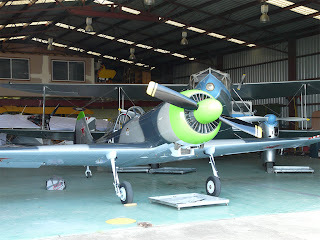 So today, Saturday 10th May, I pulled the bird out of its hangar at Camden airport for the last time. After five weeks at Camden, it was time to move DZY to its permanent roost at Bankstown airport. Taking off under a cloud base at 2500 ft, I pointed the beast north to my usual aerobatics area near Warragamba Dam. Levelling off at 1800 ft and with the engine purring smoothly, I sat back to enjoy the ride. Passing a large house on a hill off my left wing tip, I noticed some kids waving at me, so I rocked my wings in return. Overhead the dam with the cloud base still at 2500 ft and patches of mist in the area, there was no chance of aerobatics on this flight. Somewhat reluctantly, I rolled the big bird onto an easterly heading to follow the pipeline to Prospect Reservoir and then onto Bankstown airport. Arrival in the Bankstown circuit was uneventful. Rather than land immediately, I decided to perform one touch and go to get reacquainted with the airport's runways as I hadn't flown out of Bankstown since January. With the touch and go out of the way, the full stop landing was equally uneventful. As I taxiied DZY to its new roost and shut down the engine, I was a little surprised to see a few spectators gathered nearby. Soon after answering their questions, the fuel truck pulled up to feed the thirsty bird. Then Roy Fox and David Thiess (owners of the hangar) helped me push the beast into its new roost. 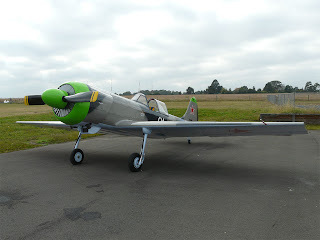 Note the twin-engined biplane behind the Yak-50. It is Roy's pride and joy - a de Havilland Dragon Rapide.